From the cradle to college, tell your sons the truth about life before they believe the culture's lies. For parents with boys newborn to eighteen, 5 Conversations You Must Have with Your Son will be as much a part of the boyhood journey as those Legos you're still finding under the sofa cushions and the garage full of sports equipment. 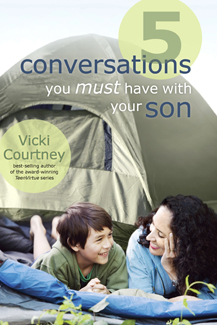 Award-winning youth culture commentator Vicki Courtney helps moms and dads pinpoint and prepare the discussions that should be ongoing in a boy's formative years. 1. Don't define manhood by the culture's wimpy standards; it's okay to be a man! 2. What you don't learn to conquer may become your master. 4. Boyhood is only for a season. P.S. It's time to grow up! 5. Godly men are in short supply-dare to become one! The book also offers invaluable tips on having these conversations across the various stages of development: five and under, six to eleven, and twelve and up. Vicki Courtney is a speaker and the best-selling author of many books and Bible studies. Among her popular writings are the ECPA Christian Book Award winners TeenVirtue and TeenVirtue Confidential. Vicki and her husband have three grown children, a son-in-love, a daughter-in-love, and a grandchild. They live in Austin, Texas where they are blessed to have all of their children living nearby. More information can be found at VickiCourtney.com. Your Girl addresses the climate of today's teen culture, the high calling of motherhood, and practical ways to counteract the negative influences our daughters face.